Richard Irwin (Belper, United Kingdom) on 3 February 2008 in Architecture. Fantastic color and composition. It must have been fun back in the old days. So we go back in time! 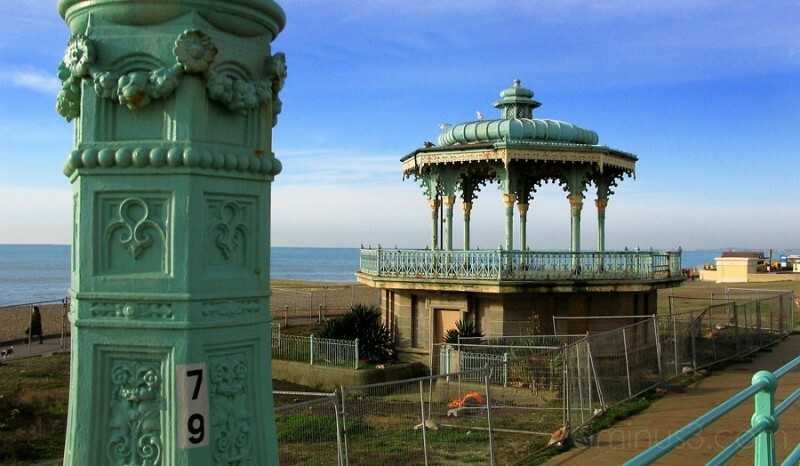 That old bandstand looks very quaint!I like it! And the colour,too! I like how you captured a different period here! I love this compo, wow that Patina is priceless and I'm very glad you resisted cropping to the left. not just because of the walker with the dog, but because it highlights the patina even more...Bravo!!! Excellent shot, so sharp! Beautiful area. Wonderful Verdigris Patina capture! What a beautiful setting for a bandstand. Beautiful work! If that's a true azure patina I'm blown away... it certainly does look like the copper oxide. Whatever the case, it's a great photo. Those structures have such pretty designs! They seem to me to have an Indian kind of design to them. This is very nice, I love these sort of structures, I hope that they are being repaired it would be heart breaking if they were being taken down. An absolutely fantabulous shot Richard.